This book was given to me by my sister for Christmas, along with a copy of Bret Easton Ellis’s American Psycho. 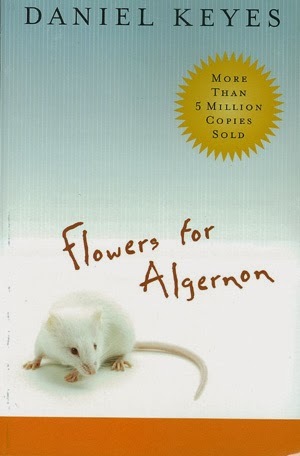 Flowers for Algernon is a science fiction novel by Daniel Keyes, about Charlie, a mentally retarded man who participates in a groundbreaking experiment to make him intelligent. As he reaches genius levels, he is confronted with life’s complexities such as morals, ethics, and the power of love. What struck me the most about the book was its accurate portrayal of intelligence. Of course, Flowers for Algernon stresses that intelligence is not what one learns, but one’s capacity to learn, and we see Charlie develop a hunger for knowledge, whether it is about language, economics, and architecture. However, we also see him develop a superior attitude, finding professors and teachers around him to be somewhat beneath him. Unfortunately, the rapid increase of his IQ left his EQ the same level before the experiment. Of course, Charlie acts the way he does because he is discovering the world for the first time. He is learning about life, the unwritten rules of society, and more importantly, himself. And when he discovers what truly matters, it is one of the most beautiful and poignant passages of the book.